In India, agricultural soil has been deteriorated by various on-going practices involving application of chemical fertilizers, pesticides and effluents. Presently, Amritsar (Punjab), an agricultural land, is undergoing rigorous cultivation of wheat and rice crops which consequently increased the application of chemical pesticides and fertilizers for high yield. These agricultural practices are not only pulling out the essential nutrients from the soil but also adding up huge quantity of heavy metals and other dreadful contaminants.Keeping this in view, the present study was planned to assess the physico-chemical parameters and genotoxic potential of soil of four agricultural fields of Amritsar, India by employing Allium cepa root chromosomal aberration assay. The responses of different antioxidative enzymes in A. cepa on exposure of Allium bulbs to different soil samples were also analyzed. In case of physico-chemical parameters cadmium was found more (9.70–30.0 mg-1.kg-1) than the typical range (3–6 mg-1.kg-1). The genotoxicity in A. cepa (treated with agricultural soil samples) revealed induction of different types of chromosomal aberrations in both modes of treatment (in situ and root dip). Among anti-oxidative enzymes, the activities of superoxide dismutase (SOD) and ascorbate peroxidase (APX) were low and gluthione-S-transferase (GST) and dehydro-ascorbate reductase (DHAR) were high in treated bulbs as compared to control A. cepa bulbs. Moreover, the results obtained in this study clearly show harmful consequences of agricultural soils of Amritsar in terms of mitotic abnormalities as well as their harmful effect on antioxidant defense system of crop plants cultivated at that particular field. Fig. 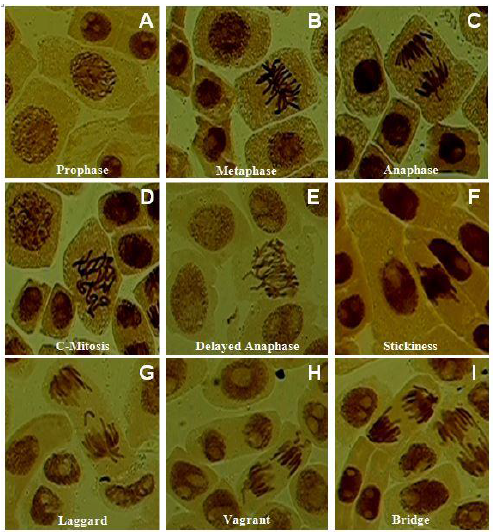 : Allium cepa root tip cells treated with different soil samples showing spectrum of aberrations: A–C, Normal stages of cell division; D–I, Different types of chromosomal aberrations.